A couple of the key points that make it necessary to think creatively when considering ICT enhanced learning and teaching (ICTELT) and the VET sector include meeting the needs of these learners who will, like all learners, have a variety of learning preferences, but may also face literacy, language and numeracy challenges, and life and work commitments. These same learners are likely to also have a rich range of skills (both formal and informal) and need a way to capture their prior learning and experience (click HERE to watch a student speak about Recognition of Prior Learning - RPL). It is also probable that these students and trainees only have limited access (at best) to connectivity and technology. On top of all these factors is the culture that is often prevalent in industry where learning 'virtually' at a distance or in a blended course is perhaps not seen as feasible or effective (click here to download a report from 2008 around the New Zealand context entitled "Using e-Learning to build workforce capability: A review of activities", and for comparison a report about small businesses and eLearning in Australia in 2008). Nevertheless, times are changing, and with them is increased access to broadband (see for example the National Broadband map for NZ and click this link for an explanation why bandwidth is important), personal ownership and use of computer(s) is increasing and mobile phones are everywhere (click here to see the 2009-2010 statistics). There is also a greater awareness that 'soft' skills such as critical thinking, as well as social and communication skills are as important as the key competencies required to be effective in a specific career. Flexibility and meeting learning needs and preferences, while making learning accessible to as many people as possible are key factors, and ICTELT and well-designed blended and distance courses appear to offer the potential to work towards these ideals. 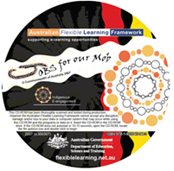 This resource provides links to a few examples and case studies of ICTELT use in VET, in particular from Australia where there is a major initiative in this sector - see for example the Australian Flexible Learning Framework who have a massive range of resources, events, research, case studies, reports, training and ideas. There are also links to a couple of associated research articles and tools. Hot off the press: A report from the Australian Flexible Learning Framework that looks at e-maturity and practices that sustain e-learning training solutions. 'Top End Groove' - a project that aims to establish a cultural tourism business and training network. The project aimed to develop and grow indigenous and cultural tourism businesses through the use of technology and eLearning by enabling knowledge sharing, improving access to skills training and creating a central point for promotion and marketing indigenous tourism. Click HERE to listen and find out more about the project. The Jobs for our Mob project was established to develop an e-training centre which incorporated technology to identify and deliver the pre-vocational skills required for indigenous people wanting to enter the mining, construction or engineering fields.Click HERE to listen and find out more about the project. This case study, "Panel beating apprentices take to technology", describes an Australia-wide skill shortage in the automotive vehicle body repair industry first prompted Brisbane North Institute of TAFE to develop a programme with training materials available on CD-Rom and online, thereby making a traditional industry area more technologically savvy. You can find out more about a recent case study from New Zealand around the Hairdressing Industry Training Organisation Training Salon of the Year 2009, by clicking this link. The page features 9 videos of learners (finalists) speaking about their experiences, and reflecting on what they have learned in the course of the training. Example of a screen capture of one on the videos you can find on the site. You may also be interest in Practice Based Learning in the workplace, and how to design learning specifically for this sector. A useful model to help with doing this is ARCS model. The model is directly related to the workplace, but has principles relevant to all learning situations. For a definition of Practice Based Learning this paper is well worth downloading (.pdf file), and Diana Ayling's presentation illustrates Practice Based Learning approaches at a specific tertiary institution. This video about experiential learning in the UAE gives a short insight into experiential learning in the workplace, and the importance of training. Examples of online environments in the VET sector If you are interested in implementing an online environment, this eLearning strategy site from Southern Australia is specifically for the VET Sector, and is well worth exploring. You can also watch this slideshow which has snapshots of Moodle sites, although they are specifically for the schools and colleges sectors. These two podcasts (part of a series of 7 interviews) feature suggestions about the design and facilitation of ICTELT resources. The focus is on the VET sector but the comments made are generalisable and applicable to learning and teaching across sectors. An ePortfolio helps students with the identification, assessment and recognition of what they know and can do, and could include evaluations, comments, feedback and reflections from peers, managers, facilitators etc who have been involved in the applicants life/learning journey. The assessment, therefore, of what a person can do is from authentic sources, collected over time (follow the links for more information on "Verification of a person's qualification e-portfolio use cases" and "Vocational Education and Training e-portfolio use cases"). 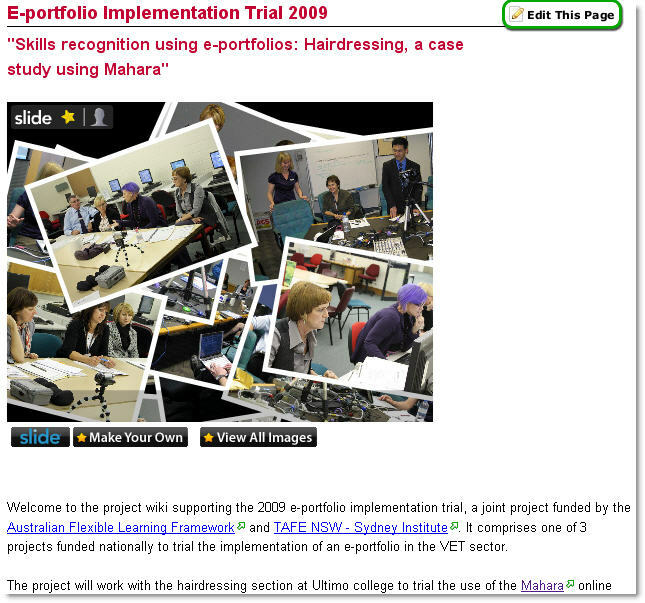 For a fuller list of resources around using ePortfolios to enhance education in general, with some examples relevant for VET, click HERE. 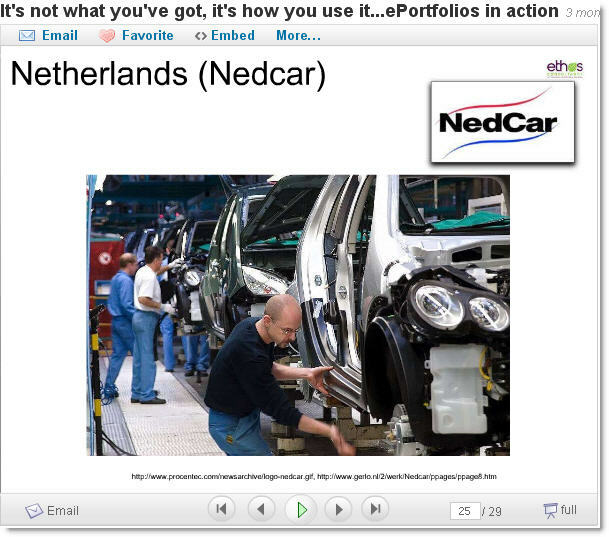 Overview of a short case study (NZ) conducted in 2008, which aimed to foster information literacy with automotive students at Unitec NZ (to read the full paper about multimedia and education, click HERE). For a fuller list of resources around using multimedia to enhance education in general, with some examples relevant for VET, click HERE. This report ("Student Learning Support Programmes that demonstrate tangible impac...") is a combination of summaries and brief case descriptions of some of the effective programmes and other support mechanisms that NZ Tertiary Learning Advisors (TLAs) provide for students in universities, polytechnics, institutes of technology, and other tertiary institutions (click HERE for the executive summary). Findings indicated that there were significantly higher course pass rate for students who used the programme (84.4%, compared to 69.8% for those who did not use the programme), as well as significantly higher final exam pass rates (71.6%, compared to 62.8%). Some of the strategies included the hosting of models, guides, examples and support in a Learning Management System (LMS) alongside personal, one-to-one support, and the use of an online skills survey. However, the main finding was that relationship and trust building, as well as recognition of learning preferences and cultural appropriacy, were key factors for success. Although it was developed in Canada, Career destination: Manitoba (http://www.careerdestination.ca/cdmb/general/pages/home/) is a useful site that offers careers advice for students. The site offers multimedia profiles, case studies, and very clear examples that cover a wide range of common career categories. To find out more about assessing and assessment that are directly relevant to the VET sector, click here. Where multimedia is used there can be no question as to the authenticity of the event / process. Furthermore, there is potential for reliable evidence, when compared with a paper-based portfolio, of competency and application of the in required skills in 'real world' contexts. Although there is no mention of ePortfolios or alternative ways of collecting evidence in these following reports, it is worth bearing in mind some of the principles mentioned: "Assessment of Learning in the workplace: A Background Paper", which can be read in conjunction with "A guide to good practice in ITO structures and systems for on-job a...". Vocational education and training: Can ICT enhanced learning and teaching help? by Ethos Consultancy is licensed under aCreative Commons Attribution-ShareAlike 3.0 Unported License. This is fantastic Hazel. A brilliant resource!! !